It's been a whirlwind couple of weeks around here. Busy, fun, crazy, happy, excited, stressful, frustrating, confusing, shocked, sad, lost,....we've run the gamut. 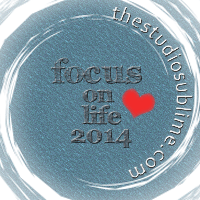 So, I'm playing a bit of catch-up today with the Focus on Life: 2014 Weekly Photography Challenge. Sally over at The Studio Sublime, gave us these two prompts for weeks 24 and 25. Week 24: Have FUN and get snappin'. To shoot with abandon, basically. 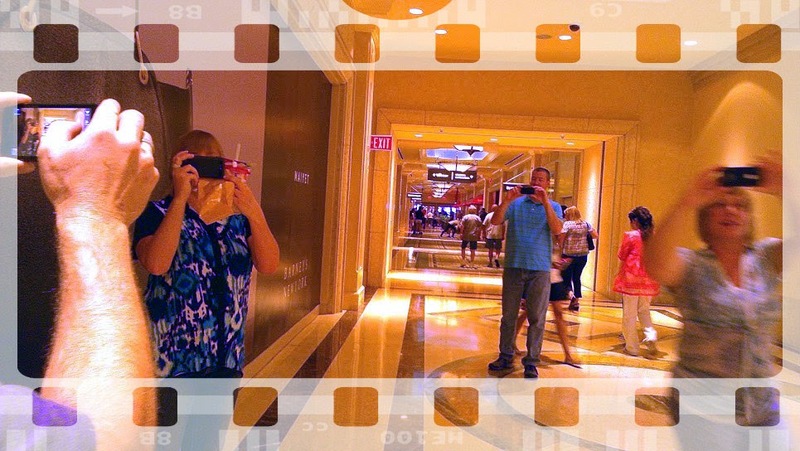 These folks are kinda making fun of me taking photos. We're all 'snapping' each other 'snapping' each other - fun. And FUNNY! (it was to us, anyway!) I laughed so hard last weekend my sides still hurt. a) full of interest; lively and exciting. b) having much or varied color; bright. Each day this summer I've tried to 'drink my colors'. I mixed various fruits in my glass each morning, add ice and water and drink several glasses and then at the end of the day, eat the fruit. It's really refreshing, especially here in the desert with the 100+ degree temps. I hope you're all having a great summer! Be sure to hop around and see what 'colors' every one else has captured this week! Peace, Love and Colorful Fun! Raspberries, kiwi and peach? Looks lovely and refreshing... I'm actually looking forward to some really hot weather here! 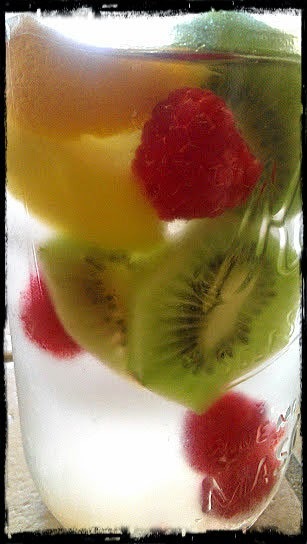 Raspberries, kiwi, lime, lemon and orange slices,...but it does look like a peach, doesn't it? Gonna have to try that, because I love peaches/nectarines - oh yummy! That lovely beverage has just inspired me to see what colorful ingredients I might have to make one. Were you at Fashion Square in the first pic? That place is huge -- it really has to be an occasion for me to visit. Finishing up my Pearls challenge creation - can't wait to see what everyone comes up with! That fruit does look so refreshing, and I bet delicious! It's really good Cynthia - the fruit makes the water just so crisp and refreshing. I got a bunch of recipes, including ones with cucumbers and rosemary off of Pinterest. Gotta love Pinterest, right?! I hope things will slow down for you soon. The first photo made me smile and the second one makes me want to try the fruited water! It's such a delicious photo! I hope things can slow down a bit too - I'm not used to so much chaos or 'busy' days. I don't see how some people do it all. You should try the fruit water - it's awesome. And, Pinterest has some great recipes for cucumber and even rosemary infused waters - they're good, too. Shel, it looks like fun with the camera "shoot" :) and that fruit looks good. I'm sending you some cool thoughts from the pacific northwest. Great pictures reflecting our prompts! The fruity water looks delicious, must give that a try. I am glad you had a good weekend laughing.